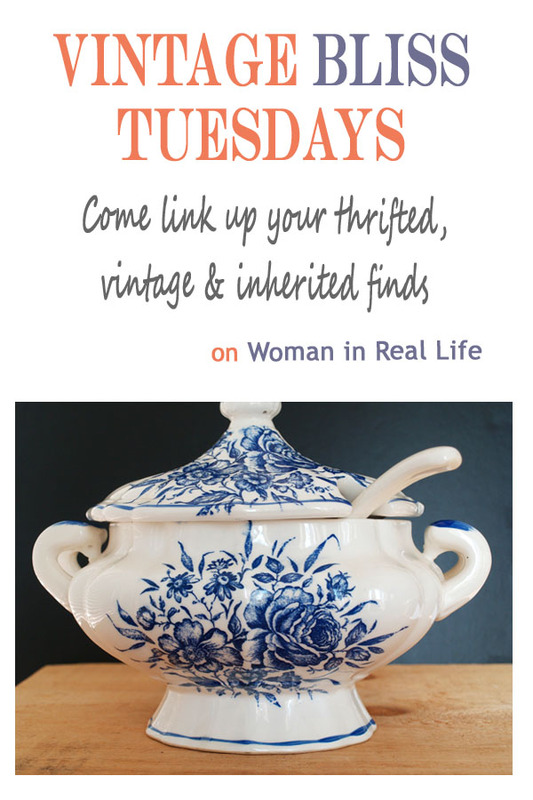 First up, I want to mention that this week's Vintage Bliss Tuesdays linky party will be live for two weeks. Why? Quite frankly, I am having trouble getting ALL THE THINGS done with a couple of oft-bored kids in the house. Who decided against summer camp again? Oh yeah, that was me. I headed into summer with visions of a sea of free days to spend as we wish - at the beach, sipping Italian sodas at the coffee shop, making vegan ice cream and reading books. And, yes, there have been such days, but I forgot to plan for the days when I have two freelance articles due, a bunch of blog posts to produce and those aforementioned bored kids to contend with. Next week we will be enjoying a few of those blissful summer days I envisioned in spring. So please, come back and link up your very cool thrifted, inherited, vintage and garage sale finds for a second week right here on this very post. You guys are the absolute best! Thrifty chicks rock. Now, on to the subject of this post - the vintage blue and white soup tureen. I have to laugh because back in June I wrote about a soup tureen that I probably shouldn't keep. I am nearing the end of my 4-month purge and soup tureens are not the optimum things to keep when storage space is at a premium. And yet when my sister (who recently moved houses) presented me with a box of dishes she no longer wanted, including this lovely soup tureen that her ex-boyfriend's mom gave her (I can see why she doesn't want it) I didn't say no. It's so pretty though. Right? Are you with me? I took it thinking I could always get rid of it down the road (because I'm so good at that, ha ha). What do you think? Should I make some space for this lonely beauty? Maybe I should force myself to get rid of the other soup tureen instead? Or should they both go? Let's hear your wisdom beautiful ladies. Vintage Bliss Tuesdays - Join The Party (For 2 Full Weeks)! Joann: I'll take back the other tureen. I almost bought one at the thrift store recently. I think your lentils & rice would look pretty presented in the tureen your sister gave you. Well if you don't have space for it right now, you could always do what I do and add it to my plastic bins filled with beautiful treasures, that some day will decorate my tiny beach cottage by the sea! Which goes against the whole purging thing. lol. I don't have that cottage yet but someday maybe! 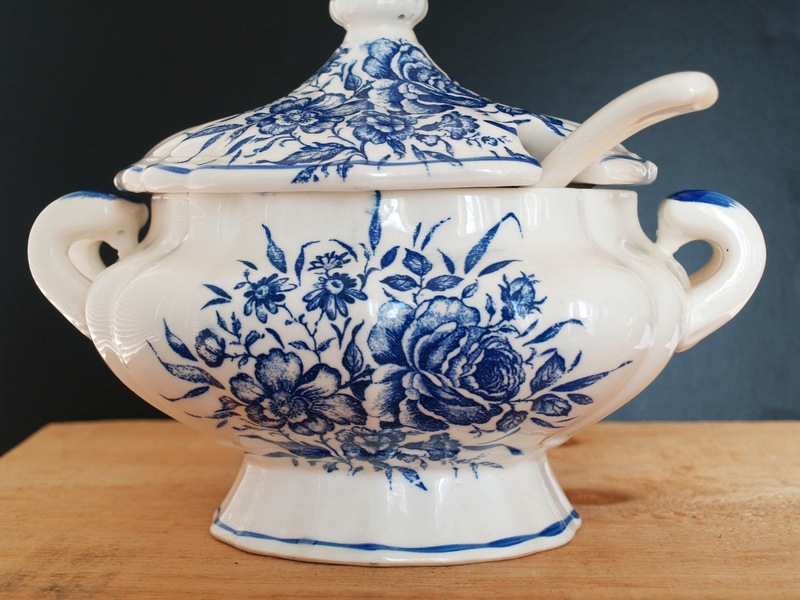 Love the soup tureen and it would go perfect in my cobalt and white kitchen! Only problem is I don't have room for it either! Can you use it as a flower planter? There's always room for a plant! Thank you! I am so impatient of plants. My husband likes them, but he tends to put the little ones on the kitchen counter and it drives me nuts. Too much goes on that counter! Thank you for the party. Hope you have some carefree days. What you wrote is what I pictured with my grands this summer and it has been hectic instead. We did have some great carefree days though. See you next week!